When it comes to baking a really good sugar cookie, the cookie is only half the battle! 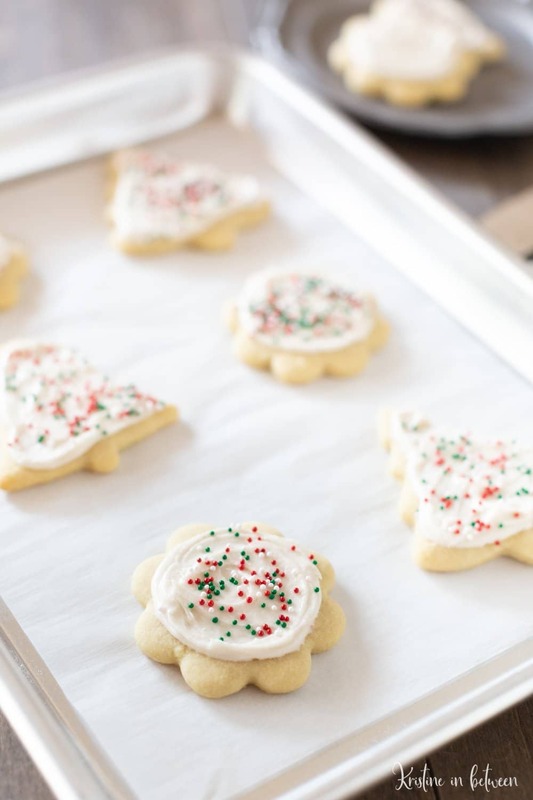 You need the perfect sugar cookie frosting recipe to go on top! Sugar cookies have always been a favorite of mine, but the frosting…well, that’s something that I can sometimes do without. A lot of the time, it’s just too sweet, isn’t it? I call it ‘icky’ sweet and it makes my belly hurt. Since I’ve been doing this whole Christmas in July thing, it seemed like the perfect time to bake a few new sugar cookie recipes. And that got me thinking…a sugar cookie isn’t as good without the frosting, but the frosting can make or break the deal (and my belly), so I knew I had to come up with a really good sugar cookie frosting recipe, one that was tasty and balanced. After making several (and I do mean several) batches of frosting, I’ve nailed it! 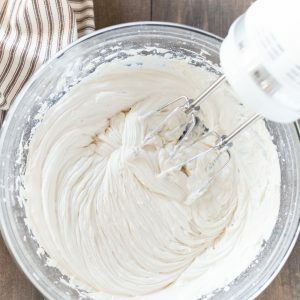 I’ve finally found the best sugar cookie frosting recipe! And you’ll love it, it’s super-duper easy to make and it conveinently makes just enough to frost about two dozen cookies, which is the same amount that most of my recipes make! 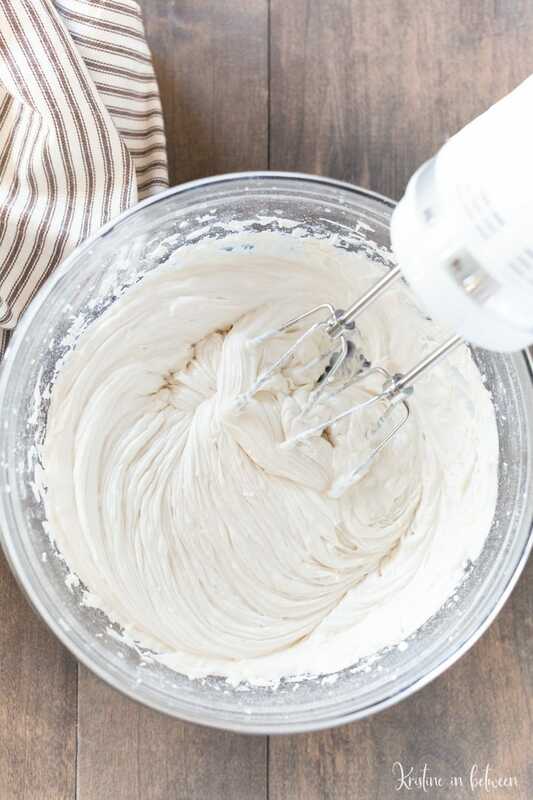 To whip this frosting up (quite literally), you just cream the butter and powdered sugar together until they’re crumbly, add the extracts and the milk (slowly) and continue mixing until it’s light and fluffy. Boom done! Add some food coloring if you want to, or just leave it white and add pretty sprinkles, but either way, it’s the perfectly sweet topping for sugar cookies! It’s the perfect amount to frost two dozen cookies without having tons left over for eating. 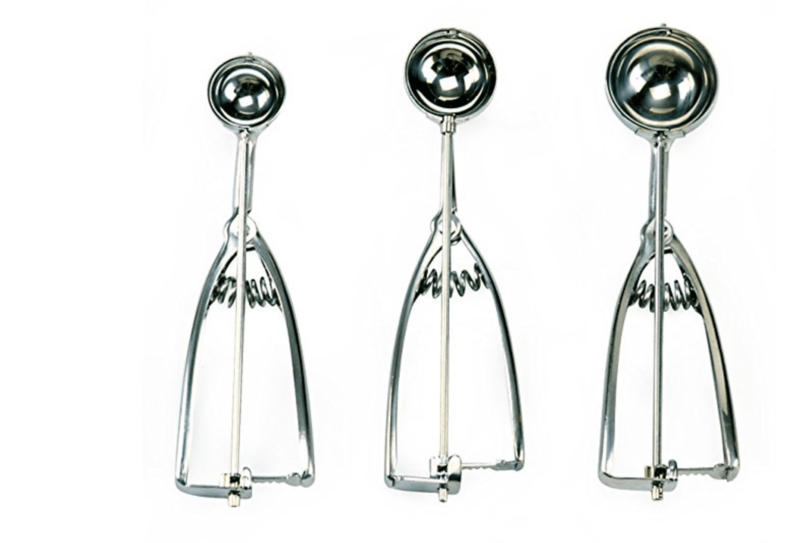 With both vanilla and almond extracts in the recipe, the flavor of the frosting is well-balanced. It’s flavorful, but not ‘icky’ sweet. Neither the vanilla or the almond are overpowering. Adding a little sea salt helps round out the flavor of the frosting, giving it that sweet and savory component that’s truly irresistible. 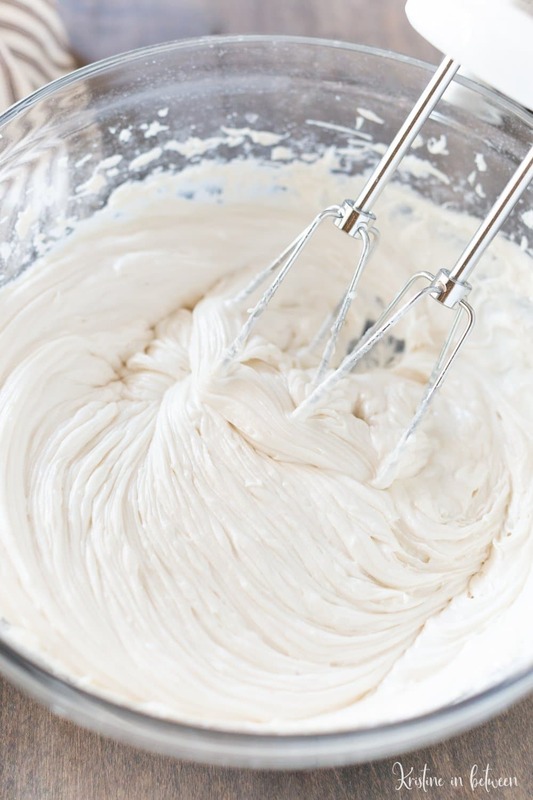 You can make this frosting thick or thin, depending on your preference. So there you go my baking friends, a real winner in the sugar cookie frosting recipe department! I challenge you to give this recipe a try with your next batch of sugar cookies, it’s so good I’m pretty sure you’ll never want to make any other one! This is the best sugar cookie frosting recipe. Smooth and sweet, perfect for topping those sugar cookies! 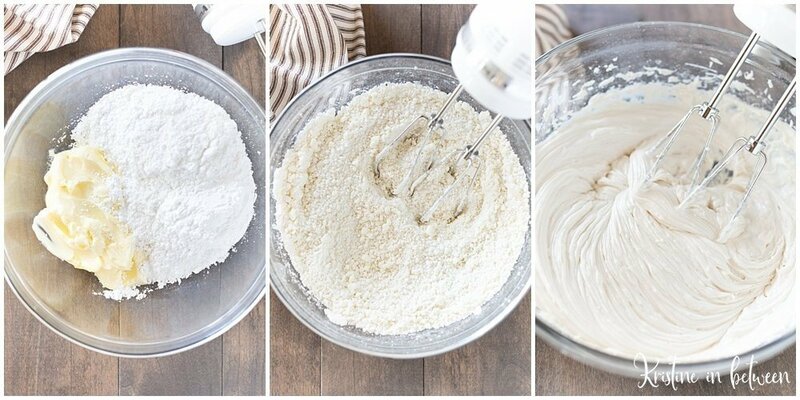 In a medium bowl with the use of a hand mixer, cream butter and powdered sugar until crumbly. Add extracts, sea salt, and 2 TBS of the milk and mix on low to medium speed until light and fluffy. Continue to mix on medium to high for 2-3 minutes. Add remaining milk, 1 TBS at a time, as needed to achieved desired thickness. Add a few drops of food coloring to color frosting if desired. *Frosting may be separated to create several different colors from one batch. Did you make this recipe? We want to see!Mention @kristineinbetween or tag #kinbetween! These traditional cut out sugar cookies are the best recipe I’ve found! They go just perfectly with this buttercream frosting! Download our free planning page printable to get you organized and design every detail of your day. Sign up for email updates and get planning today! Hi there, I’m Kristine! Cookie baker, photo taker, fitness lover. I retired from Medical Transcription after 20 years to blog full-time. I live in Arizona with my husband and our two girls. I believe in finding balance between health, happiness, & homemade cookies! Oh mannn I love a good sugar cookie with a thick layer of icing. Reminds me of Christmas cookies with my mom! Heck yes, Ashley! Christmas cookies, and the frosting, are the best thing ever! ? Yum this cooking frosting looks great. I’d love to dip a spoon in that bowl! Need to give this a try! Thank you so much Jacqueline! Me too, I could seriously eat it by the spoonful! Hope you love it. Happy baking! Yumm! Now I’m craving sugar cookies! Well you’d better whip some up, Danielle! LOL, nothing like a little holiday baking in July! ? I completely agree! The cookie is only half the battle 😉 This frosting looks beautiful! You’re my kind of people, Kelly! Thank you so much! ? I love when sugar cookies are frosted. You are right some frostings just aren’t that good. I can’t wait to try yours, it sounds easy and delicious! Welp, now I have to make frosting because I promised my hubby sugar cookies and this looks too good not to make with them! Haha, I would agree to that! Sugar cookies NEED frosting! Thank you so much! I love having a great simple staple like this at my fingertips. This looks like a winner! Thanks Jenni, it’s definite a go-to recipe. Hope you love it! Sugar cookies are the best and this frosting looks amazing!!! A great recipe to have on-hand for the future, thanks! Thank you so much, Georgie! You had me at sugar cookie frosting! I want to lick the screen, it looks so good. 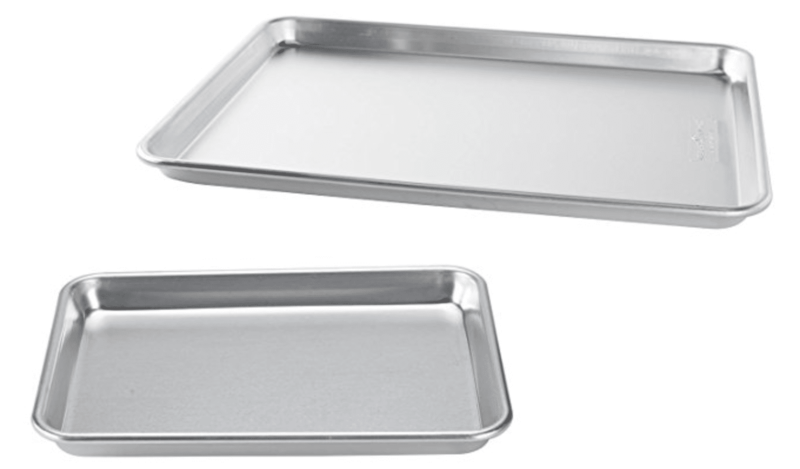 I’ll be making this to frost all kinds of things! Is there a way to not that sweet.? Hi Kim! Well…buttercream is basically all sugar, haha, so I’m not sure how you could make it less sweet. You could try adding more salt to balance the sweetness, or more vanilla (or almond extract if you prefer) to add more flavor to help cut the sweetness, or maybe use a lot more butter, but I’ve never tried increasing the butter. Happy baking! Yes, notify my of replies to my comment! Sign up for email updates & receive our FREE cookie eBook that's filled with our favorite simple cookie recipes!